ARCHBISHOP Anthony Apuron owes Guam Catholics an apology, said Joelle Casteix, a member of the Survivors Network of those Abused by Priests (SNAP). Castiex also said it was troubling that a statement from SNAP was what prompted Apuron to remove John Wadeson. “Why weren’t the voices of Guam’s Catholics enough? Why isn’t zero tolerance enough?” she asked. Wadeson was recently removed from active and public ministry by Guam Archbishop Anthony Apuron due to growing public concern over Wadeson’s past. According to SNAP, Wadeson was accused of molesting two children sometime between 1973 and 1977, a claim deemed credible by the Archdiocese of Los Angeles. At the time, Wadeson was ministering in the Los Angeles archdiocese, but the accusations led to the archdiocese being prohibited from ministering there. The accusations against Wadeson were published in a statement by SNAP on July 18. The network also called on Apuron to remove Wadeson and reach out to anyone who may have suffered misdeeds by Wadeson. Castiex agreed with Clohessy. “Apuron knowingly allowed this priest to live and work on Guam. He turned his back when Guam’s Catholics expressed outrage. 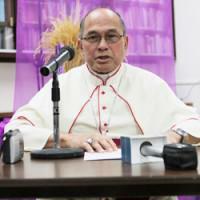 He tried to stonewall when the papal nuncio visited recently,” Castiex said. Castiex said she is currently looking into allegations of sexual misconduct against other priests working and living on Guam. Castiex said she follows local blogger Tim Rohr’s blog, Junglewatch, which is the source she cited regarding Apuron’s actions. Rohr said he was not the only whistleblower and found out about Wadeson’s past through other people who emailed him links of the Bishop Accountability’s website detailing accusations against Wadeson. “They first started sending me links after it became known that the archbishop had fired Rev. Paul (Gofigan) because he supposedly was harboring a man who the archbishop said was a ‘danger’ to children,’” Rohr said. Rohr said the way Apuron treated Gofigan was in stark contrast to how he treated Wadeson. “The only ‘whistleblowing’ I did was (a) post on my blog. Others must have picked it up and contacted SNAP, or maybe SNAP had already been reading,” Rohr said. Until Tuesday’s announcement by Apuron of Wadeson’s removal, the priest had been serving in the Agana Archdiocese since 2000. Other than the statement announcing Wadeson’s removal, little other information has come from the Archdiocese of Agana about the subject. Calls to the archdiocese have not been returned. Based on the Agana Archdiocese’s 2013 directory, Wadeson has been an incardinated priest of the Agana Archdiocese but serving in San Francisco. Rohr said this raises the question as to whether or not the Archbishop of San Francisco was aware that Wadeson was functioning as a priest in the San Francisco diocese. Further, Rohr questioned whether or not Apuron properly informed the Archbishop of San Francisco that Wadeson could minister in the area with appropriate permission.